However, despite the weather, our impression of the town steadily improved. Tony and Gayle went into town and did some shopping, stopping for coffee and a chat with Maria from Venezuela and B from Poland — both women living on their own boats in the bay. Maria works in the restaurant and B takes backpackers between Portobelo and Cartegena — stopping in the San Blas islands (Kuna Yala) along the way. Gayle M and Miriam depart with luggage in the dinghy. Sunday evening, we ate at Maria’s restaurant. It felt quite fancy after our weeks in the San Blas islands which have only the simplest of dining establishments. Pete and I enjoyed the lobster spaghetti. However, Tony cried that he was sick of lobster and wanted fish instead — he and Gayle each got a whole fried fish for their dinners. There are lots of sailboats in Portobelo Bay (maybe ~70 boats): big enough for a cruisers’ net (on the VHF radio) and an active cruising community. Gayle introduced us at the Monday cruisers’ net and we got a special invitation to attend Julie’s birthday party that afternoon. We debated the motive of the invitation: another boat had also introduced herself on the morning net. However, only On Delay, the big catamaran with two cruising couples aboard got the special invite. We are a novelty and local cruisers are curious about us (in addition, of course, to being welcoming to us). 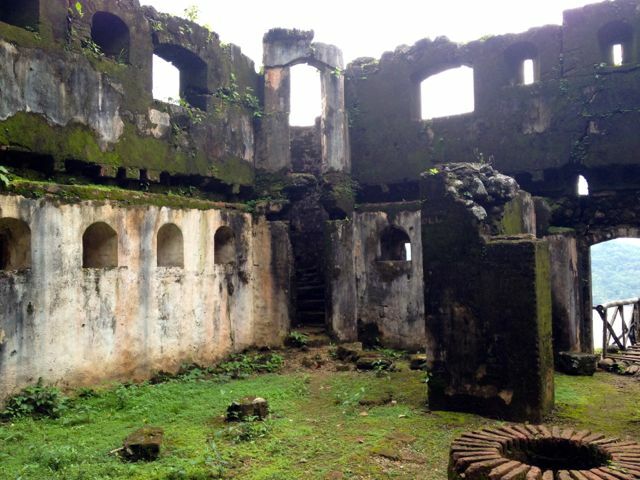 Portobelo has a long and interesting history. The Spanish fortified it heavily (after a number of attacks by the English) and used it as one of their primary Atlantic ports to ship precious metals from the new world to the old. For example, silver was mined in Peru and shipped up the Pacific coast. It was unloaded in Panama City and taken across the isthmus by land and waterways to Portobelo where it was loaded onto ships and taken across the Atlantic to Spain. 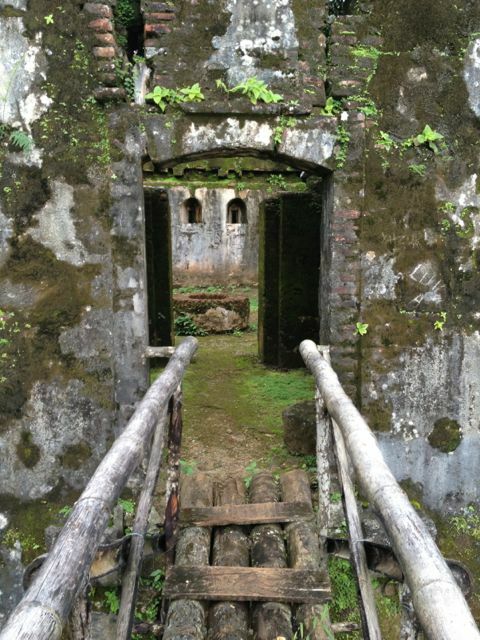 The forts in Portobelo are not restored like the one in Cartegena and only minimally maintained), but they are open to the public and we enjoyed strolling around them. 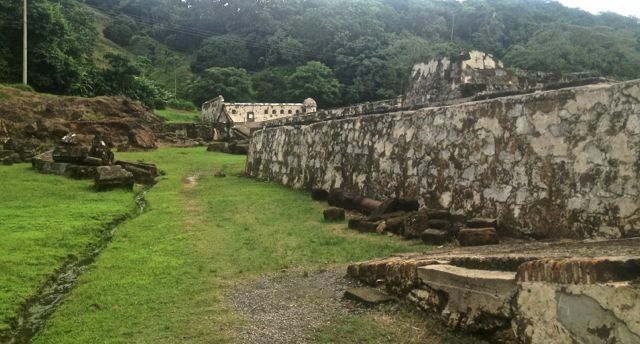 Part of the impressive Batería Santiago in Portobelo. 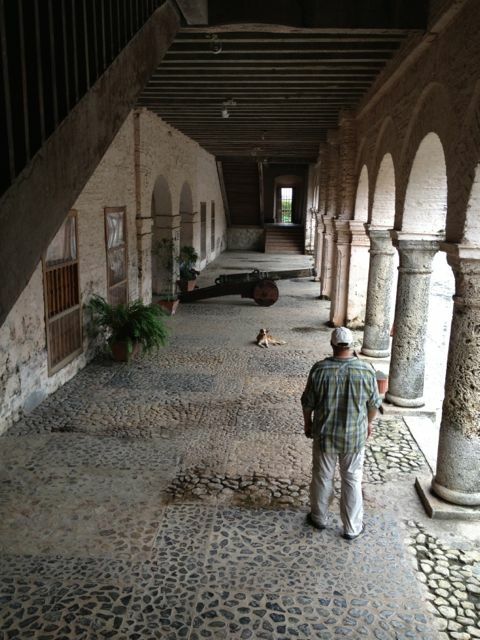 Tony poses at the Batería Santago in Portobelo. Batería Santiago and Portobelo Bay viewed from above. Only Tony Day climbed all the way to the lookout above the bay. Crossing the moat at the lookout above the bateria. Inside the lookout. Note the well in the bottom right of the photo. 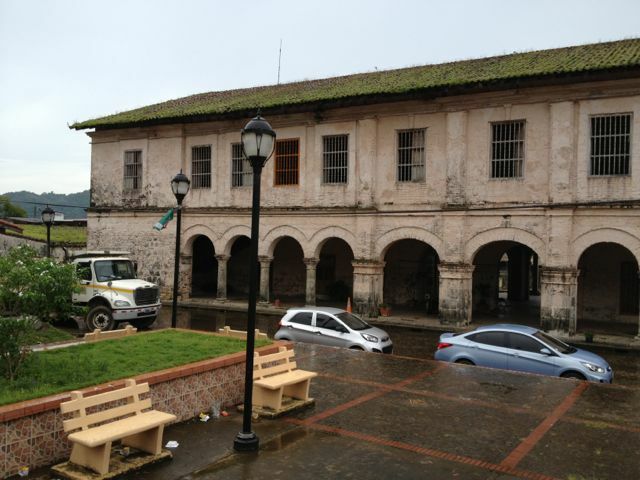 With help from the Spanish government, Portobelo has restored its original customs house. 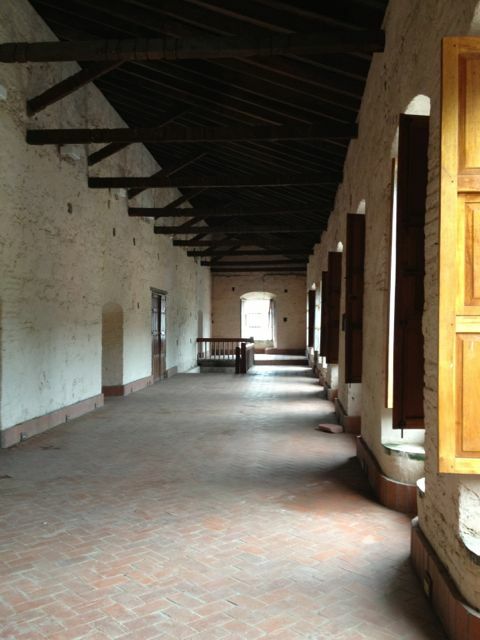 It is an impressive building; the ground floor houses a nice museum which tells the history of the town. The customs house as viewed from the town square. Pete, dog, and canon on the ground floor of the custom’s house. 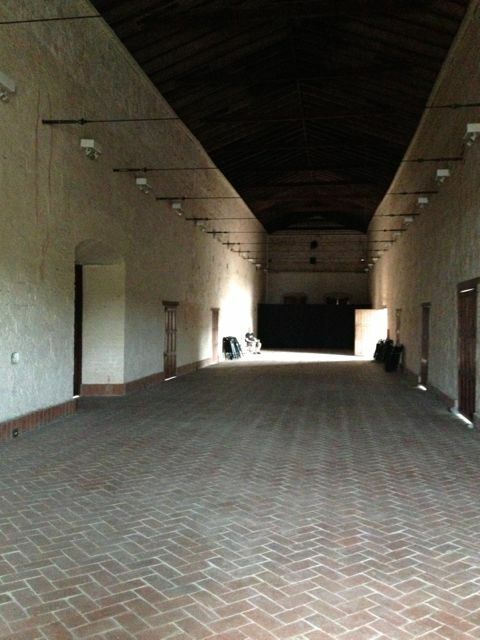 The interior of the customs house: first floor. Open gallery of the customs house: first floor. Julie’s birthday party was fun. It was held at the new restaurant on the waterfront. There was cake and coffee and beer and a good group from the cruising community. We exchanged stories and enjoyed conversation. In short order, I found the other Canadians in the group — a couple from Montreal. Canadians are so nice: The following morning, Klaus and Carole stopped by in their dinghy with a novel that they thought I’d enjoy. The restaurant has lots of shelves of books for swapping: cruisers leave books and take new ones. We made some good swaps. 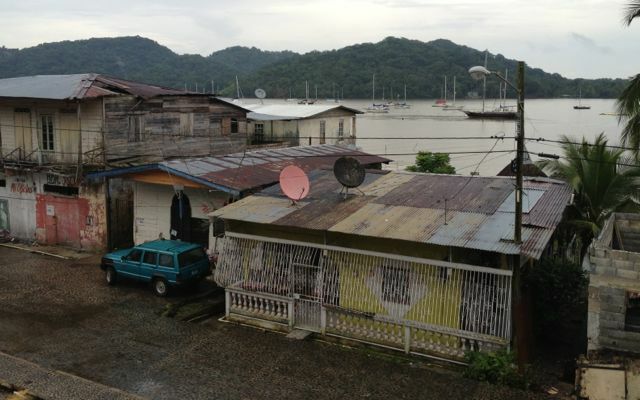 When we first pulled into Portobelo, I found myself wondering why so many cruisers get stuck there. But by the time we left, I understood. It is a friendly community of cruisers (of mostly moderate means); they look out for each other and help each other. To round out our busy day in Portobelo, we visited the church, saw the workshop where Wynn and Chris are making dinghies, ate pizza, bought art, did assorted shopping, and discovered a carbonated cranberry-rum soda for Gayle to drink while we drink beer, and had drinks and dinner at Captain Jack’s where backpackers and cruisers hang out. The church of the Black Christ as viewed from Captain Jack’s establishment. Over drinks we chatted with a group of backpackers who were waiting to sail with B to the San Blas islands that night. Colombus discovered it in 1502 on his fourth and final voyage. The Spanish made Portobelo their primary port in Panama after Nombre de Dios, 27 km to the east, was attacked by Sir Francis Drake. 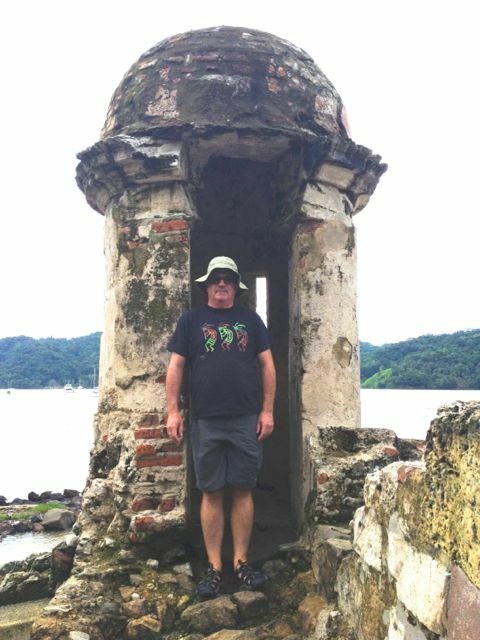 In its heyday, Portobelo was famous for its annual fair when people came from all over the world (Europe, the Caribbean, South America) to trade goods. The arrival of the fleet (40 – 70 boats) from Spain signalled the start of the wild fair. Not only goods but also diseases were traded — the museum had documented that, in a fleet of 2,000 soldiers and sailors, ~500 died during fair. 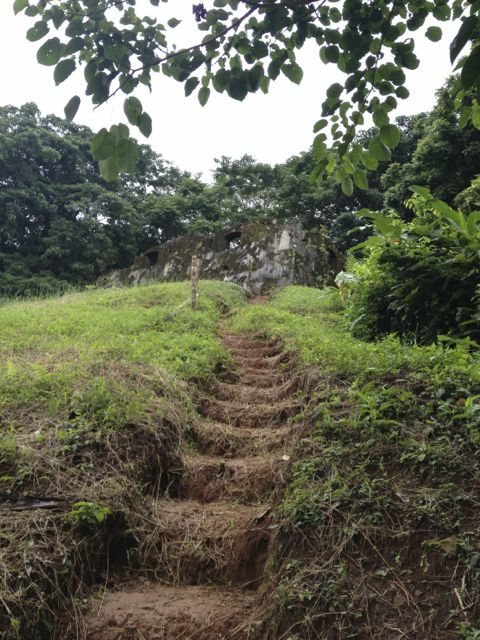 Sir Francis Drake is buried in Portobelo bay. He died of yellow fever while his fleet was anchored in the bay (after he failed to sack San Juan, Puerto Rico). He was buried in full armour in a lead coffin. 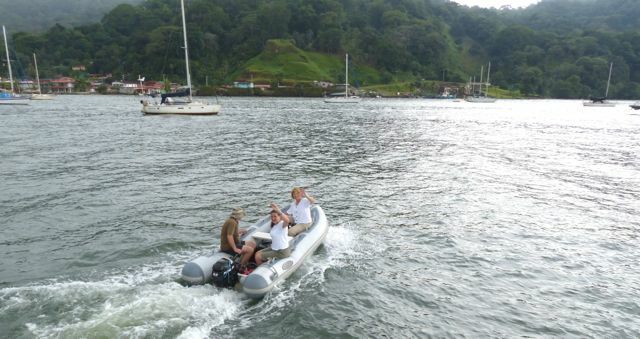 The British government has asked the Panamanian government to prevent and prohibit any attempts to find or raise the body. 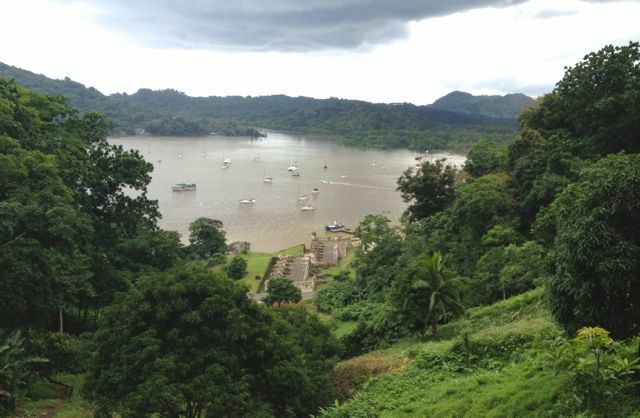 Portobelo was a popular spot with the English: the first attack by a pirate named William Parker was in 1601 and the last was Admiral Edward Vernon of the British Navy, who captured the town in 1739 (in the War of Jenkins’ Ear). And, the ubiquitous Captain Morgan sacked the town in 1668. 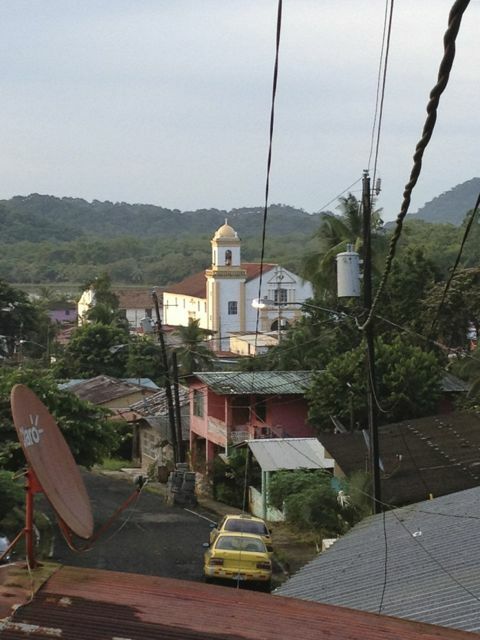 The Scottish connection to Panama continues….there’s a village outside Edinburgh that’s called Portobello……here’s an outtake from Wiki..
By the 18th century it (Portobello, Scotland)had become a haunt of seamen and smugglers. In 1742 a cottage was built on what is now the High Street (close to the junction with what is now Brighton Place) by a seaman by the name of George Hamilton, who had served under Admiral Edward Vernon during the 1739 capture of Porto Bello, Panama, meaning literally “beautiful port or harbour”, and who named the cottage Portobello Hut in honour of that victory. That’s awesome! Thanks for this comment. There are so many examples of New World places named after Old World ones. This is the first example I know of the reverse case. Don’t forget when you go into a Church of God no matter what color He is, you get three wishes. Thanks for the info; very interesting. What, no mushrooms? 🙂 Sounds like you had a very good and informative visit, again ;-). Thanks for keeping up with our worldly education, and the great pix! It’s been my experience that lots of places don’t seem to be much, until you explore. It sounds like you guys have done a great job of that, here, and in other places.. I love hearing about your experiences! That fort looks creepy. Don’t go in there at night. Like the pic of T with “turret syndrome”. Miss you guys. Cool forts followed by a birthday party and pizza? Sounds like fun to me!